The mode was unveiled in a recent PlayStation Blog post and finally provided some context around the separate co-op mode we've heard about for the past few months. This mode is, essentially, offline practice so you can "git gud" for the online PvP battles. You'll be able to team up with A.I. allies and go against A.I. bots in a 10-vs-10 battle, or control a Hero character and go up against a lot of foes. Much like the PvP battles, you'll be able to customize your character with a variety of weapons and abilities that you unlock (either in PvP or Arcade), so if there's a particular "build" you want to try, this is the place to do it. 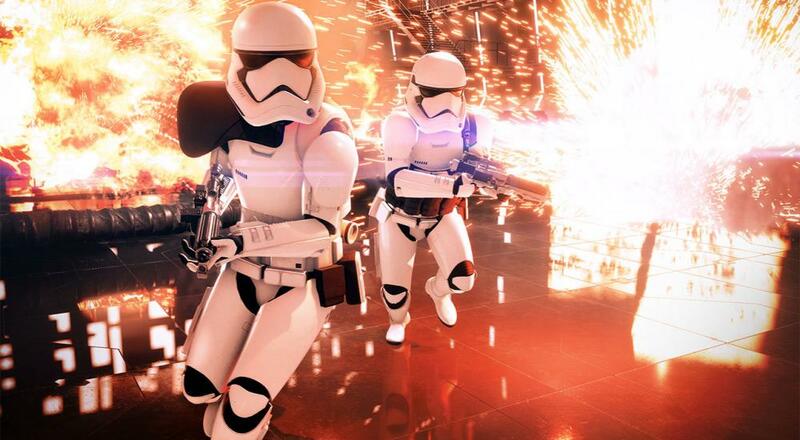 Along with that, though, there will be some unique "Battle Scenarios," which sound like they may be somewhat similar to the co-op challenges from Battlefront's Skirmish mode. All of this can be done with a friend locally on the consoles. If you've pre-ordered the game, you'll get access to the forthcoming beta on October 4, a couple days ahead of when it switches over to an open beta. It's unclear from the blog post if the local co-op will be part of that beta, though I imagine it would have to be. [UPDATE]: The new beta announcement trailer does show splitscreen co-op, which means you'll be able to play that when during the special "pre-order" beta that starts tomorrow, October 4, and the open beta that kicks off on Friday, October 6. The beta comes to an end for everyone on Monday, October 9. Star Wars Battlefront II will be available on PC, Xbox One, and PlayStation 4 on November 17, 2017. Only the consoles, though, will support the two player couch co-op in the Arcade mode, which means there will be no co-op options what-so-ever for the PC (sorry, PC players). Page created in 0.8843 seconds.